A dermastamp is actually suitable for any type of scars (both indented and raised) as long as the area is not extensively large so that stamping is doable. In many cases, the scar will improve in its appearance and becomes less visible. Stamp the same scar 6-8 times. You should get about 250 pricks per cm2 (1500 pricks per square inch). Our small dermastamp has 35 needles. If you heal well, you can stamp slightly more densely the next time, especially if you have seriously deep scars. You have to experiment. Yes, a dermastamp is effective for lip lines (use a 1.5 mm stamp with 35 needles) and easy to maneuver in the area around the lips. The area around the lips is very sensitive and you will likely need a numbing cream. Yes, you can use a 0.5 mm dermaroller in between the once-every-three-week rolls with long needles. It does apply, especially if your skin is sun damaged. 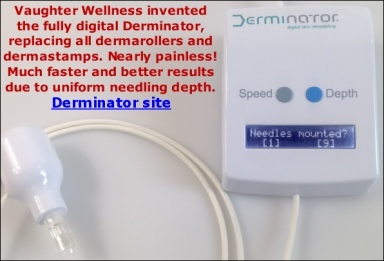 Dermarolling works even without any preparation. The preparation is supposed to establish favorable conditions in the skin for collagen production. Many of our customers improved their acne scars with dermarolling/stamping but not many were successful in reducing the pore size. Pores are not scars, pores are ducts in the skin and there is currently no method that can reliably and permanently reduce them. Dermarolling however often helped normalize acne prone skin and post-acne pigmentations. I like money just as much as anyone else, but you really should only buy the dermastamp in your case. That will really be sufficient and the added value of any vitamin creams in your case would be so marginal as to be insignificant. Wow, you have actually extremely beautiful skin.. No pores, smooth texture and tone. Most people can only dream about a skin like yours. You have just a couple of shallow scars. Use a 1 mm dermastamp every 10-14 days on them. Lagale: More people complain they can't see the pictures in this new forum, would you mind telling me what browser you're using so we can try to solve it? Dermarolling / Microneedling / Re: Can't find proper disinfection alcohol? The cost of shipping can be seen in your shopping cart. At the bottom is a cost estimator for each country. You should resize your photo in some image manipulation software or photo management software so that is is no more than about 800 pixels wide. If that still doesn't work, you should JPEG-encode it, with a compression factor of 20. If you don't manage, I will try to answer your question without having a picture. If you use Tazorac cream, do not buy Tretinoin. It is not necessary. They are both Retinoids. Everything you describe is completely normal after needling. The stretch marks do get swollen and red. You should not worry too much about infection. None of our customers have ever reported an infection (one customer got a bad reaction on one cheek after rolling her whole face but I am not even sure whether it was an infection or just a reaction and in any case, it was gone in a couple of days without any problems), neither you can find much about dermarolling infections on the Internet in spite of the fact that tens of thousands of people are home-rolling or having dermarolling treatments nowadays. Yes you can clean the skin with alcohol after rolling/needling if you want to. Overnight soaking will not harm the roller but do not soak it overnight routinely because alcohol could dissolve/loosen some parts of the roller. Needling is a much more targeted treatment and it is more successful in crushing hardened collagen bundles that are present in many stretch marks, surgical, accident and some other scars. Needling also goes deeper. There is absolutely no problem stamping your cheeks if you have whiteheads elsewhere. It is just not a good idea to roll or stamp over really serious acne (painful acne with pus). If your ice pick scars are very deep, use a 2 mm dermastamp. If they are just deep, use a 1.5 mm dermastamp. If you have post acne spots or a skin that is prone to acne, or uneven pigmentation or texture, add rolling with a 0.5 mm regular dermaroller. Dermarolling / Microneedling / Re: Couperosa and microneedling? Even though dermarolling is often recommended for broken capillaries, from our experience, it does not improve broken capillaries. You should better try a vascular laser. The light of the laser is absorbed by the skin, especially by hemoglobin in the blood. This absorbed energy heats up the blood vessel so much, that it seals it. Unfortunately, this treatment is not always successful (the vessels may reappear) and it can in some rare cases have side effects (burns, hyperpigmentation or hypopigmentation etc). Your scars actually do not seem to be very deep. You have some problems with your skin texture and hyperpigmentation. Is your face always red like on the photo or was it just a temporary problem? I recommend you a 0.5 regular dermaroller (roll your entire face about twice a week) and a 1.5 mm dermastamp (stamp your scars densely every three weeks). You could also try our Tretinoin cream. It helps with pigmentation and it helps keeping acne under control. Buy the 0.025 % strength (not stronger) because you seem to have sensitive skin that gets easily irritated. No, the increase in contrast is not natural after dermarolling but are you sure it is not due to the summer season? Even if you always apply a high factor sunscreen, the melanocytes will still manage to get stimulated by the sun and produce the melanin pigment. They will produce much less than if you do not use any sunscreen but there is no sunscreen that can provide a 100% sunblock. You can continue with dermarolling but roll only a small part of your face to see what happens long term. It will help you deciding about the rest of your face. Sure it will let you - exactly what happens when you try?